Nucor, TerraForm Power, and Retail Opportunity Investments Corp. all make the cut. The stock market has been on a tear for nearly a decade. But in recent months, the S&P 500 has fallen about 10% from its highs, entering correction territory on a number of fears, including uncertainty over global trade, rising interest rates putting pressure on the economy, and even fears that a recession could be just around the corner. And while there's no predicting what the economy or the stock market will do in the near term, stocks remain likely to be the best long-term investment out there. For investors looking to weather the market's uncertainty but who also want to profit from stocks, high-quality dividend stocks should make your list. Three that look particularly appealing are Nucor Corp. (NYSE:NUE), Retail Opportunity Investments Corp. (NASDAQ:ROIC), and TerraForm Power Inc. (NASDAQ:TERP). Not only has the recent market decline put all three on sale, but these are three of the best businesses in their industries, generating steady cash flows and paying generous dividends to shareholders while also retaining money to invest in future growth. Steelmaking is notoriously cyclical. It's also very capital-intensive, and most steelmakers have high fixed operating costs. This combination makes them very susceptible to quick losses when the demand cycle turns. 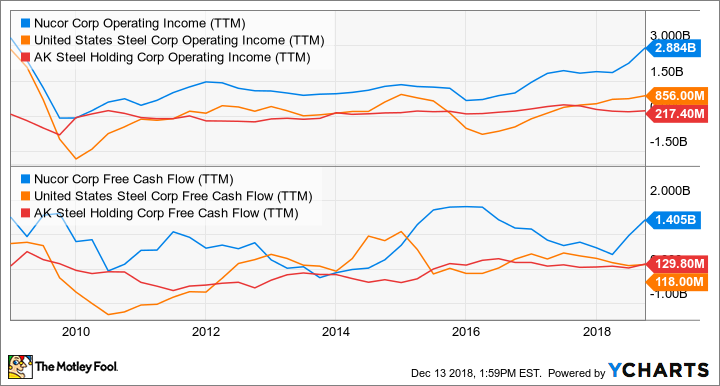 While Nucor isn't immune to the cycles, it has a serious killer advantage over most other steelmakers: an operating model that gives it more flexibility to scale its production (and expenses) up or down based on market demand. NUE Operating Income (TTM) data by YCharts. This has helped Nucor to do two things other steelmakers haven't: pay a dividend every year and increase its base payout -- every year for over a half-century. It just announced a 5% increase. With shares down 21% from its 2018 peak, it now yields nearly 3%. With Nucor's earnings at near-record levels, the big decline in its stock price has made Nucor relatively cheap at less than nine times trailing earnings. This is a best-in-class company with elite management, trading for a single-digit valuation. Dividend investors looking for a rock-solid payout should put Nucor at the top of their buy lists. E-commerce is significantly altering the retail landscape. Between the convenience of quick shipping and the growing selection of goods available online, the growth of e-commerce isn't going to slow anytime soon. And that shift is going to continue to disrupt retailers that can't compete with e-commerce's advantages or adapt to the new retail world quickly enough. But even as e-commerce grows its share, traditional retail is doing far better than most people realize. And Retail Opportunity Investments Corp. -- called ROIC -- is one of the best investments to profit from this reality. In Tanz, ROIC has one of the best capital allocators operating in retail real estate. Since taking ROIC public, Tanz and his team have done an incredible job identifying properties that fit the company's mold while remaining patient in their acquisitions and avoiding overpaying simply to meet a growth number at the cost of earnings. This cautious, disciplined approach has meant steady, profitable growth and allowed ROIC to keep a strong balance sheet. It also generates about 45% in funds from operations -- the best proxy for earnings for real estate investment trusts like ROIC -- than it needs to maintain its dividend. Besides being a substantial margin of safety to support the payout, those extra cash flows also help fund growth. 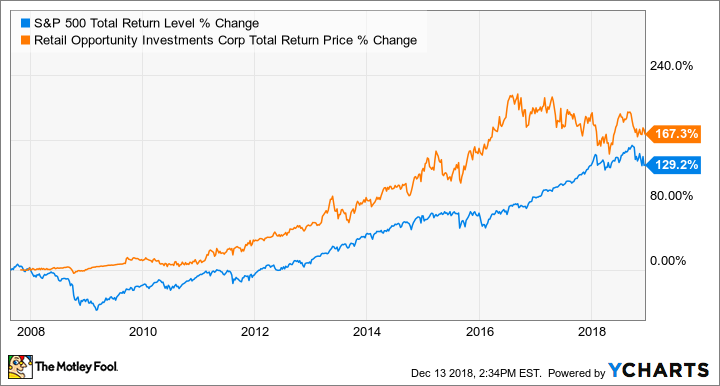 At more than 15 times 2018 funds from operations, ROIC isn't particularly cheap, but it's a premium worth paying for such a high-quality dividend growth stock, particularly when its 4.4% dividend yield is factored in. It's been a great year for TerraForm Power, though you might not know it just looking at its stock chart. But while the stock price is down about 5% from its 52-week high at this writing, the quality of its business has steadily gotten better under a new management team since Brookfield Asset Management bought a controlling interest in 2017. Over the past year, management has taken steps to grow TerraForm Power, drive down operating costs, and make those operations work better. In the third quarter, TerraForm Power reported almost 46% growth in power generation, following the closure of its acquisition of Saeta earlier in the year. At the same time, it grew cash available for distribution 142% -- 69% on a per-share basis -- as operating improvements helped drive more of that power generation growth to the bottom line. And there's more improvement coming, too. Management says a new maintenance agreement with GE will drive those costs down as much as 10%, while also helping improve power production from those facilities. TerraForm Power doesn't have the margin of safety on its payout other stocks do, with 86% of CAFD going to pay the dividend last quarter, but if management keeps making the kind of progress we have seen in recent quarters, cash flows should grow substantially faster in coming quarters. With Brookfield Asset Management's track record with other subsidiaries, I think the extra risk here is well worth the reward, and my expectation is that the payout -- yielding 6.6% at recent prices -- is more likely to go up than down in both the short and long term.